LifeNets is very thankful to resourceful young people in Australia who were motivated by the need to help less fortunate people in developing countries. They devised a greeting card fundraiser that served a numbe of purposes. The artwork was created by our brethren (youngestis eight years old) in Australia who were able to show share this talents with people around the world. The funds were raised for LifeNets managed projects Kenya (heifers) Brazil and Guatemala (youth corps for agricultural and orphanage programs) and for LifeNets biggest project every year: Scholarships! Almost $8000 was raised for the LifeNets Developing Nations Scholarship Program (www.lifenets.org/scholarship). This year we have 104 students receiving scholarships at a cost of $92,000. This donations is a BIG BOOST towards this most valuable program that bring a status change in our young people that lasts a lifetime. LifeNets is very thankful for this generosity, resourcefulness and love from our friends in Australia who successfully managed this fund-raiser at all these locations! We have many people to thank including Laura Watson, Samantha Thomson, Keith Lippincott, Alexander Love. Bev and I thank Mr. Bill Eddington in Melbourne for all the comnmunications with us personally to get this project off the ground and make it the success it has become. In 2011, I was chatting with my two good friends – Alexander Love and Laura Watson (UCG, Melbourne East Congregation, Australia) - about a film we had seen. It was one of those films that explores the inequality of how some people live compared to others, and we were feeling pretty discouraged about how the world works. Having had these types of discussions before, we also acknowledged that whatever ‘bad’ feelings we had would leave, probably in a few hours, and that we’d quickly go back to our insular focus. Frustrated by this human response, we started to brainstorm what we could do to help assist church members who were struggling financially. 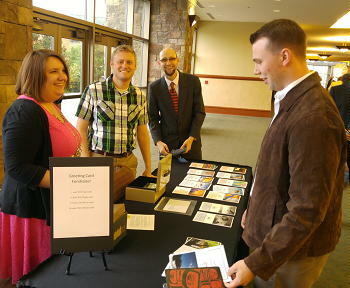 After much discussion, we eventually arrived at the idea of selling church-made cards to church members to raise funds. This worked towards a range of goals: 1) it would raise money through providing a quality product to church members; 2) it would facilitate communication between church members, family and friends; 3) it allowed a range of church members to be involved through submitting card designs; and 4) it provided an opportunity for youth to participate through organising and selling the cards. We named the project accordingly – the ‘Youth Card Project’. 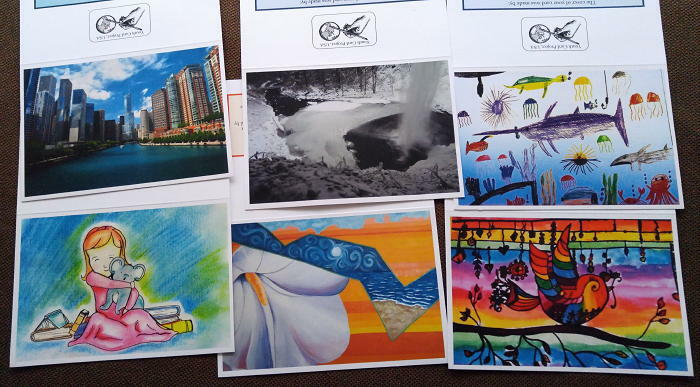 I set about collecting designs from members, which included a range of beautiful photographs, drawings, paintings, finger painting from children, and even some poems. We had no idea how talented some of the Australian brethren were! It was a delight to see many people, of all ages, submit designs. We then needed to know where we could sell the cards and where exactly the money would go. We piloted card sales at an evening church social in our local congregation, which was a huge success. We reasoned that the Feast of Tabernacles was a time of card writing and receiving (as well as God’s other Holy Festivals), and that it was an annual time where many church members were gathered together. It also pictures a time of peace and equality for the world. So we sought permission to sell the cards at Feast sites across Australia and New Zealand. This was approved. We decided to contribute the money to our local congregation’s LifeNets project – the Heifer Project in Kenya. LifeNets was the organisation chosen as it has a strong focus on local community projects to benefit brethren and their communities, it is run by church members, and is not-for-profit. Sales across Feast sites were again a huge success! 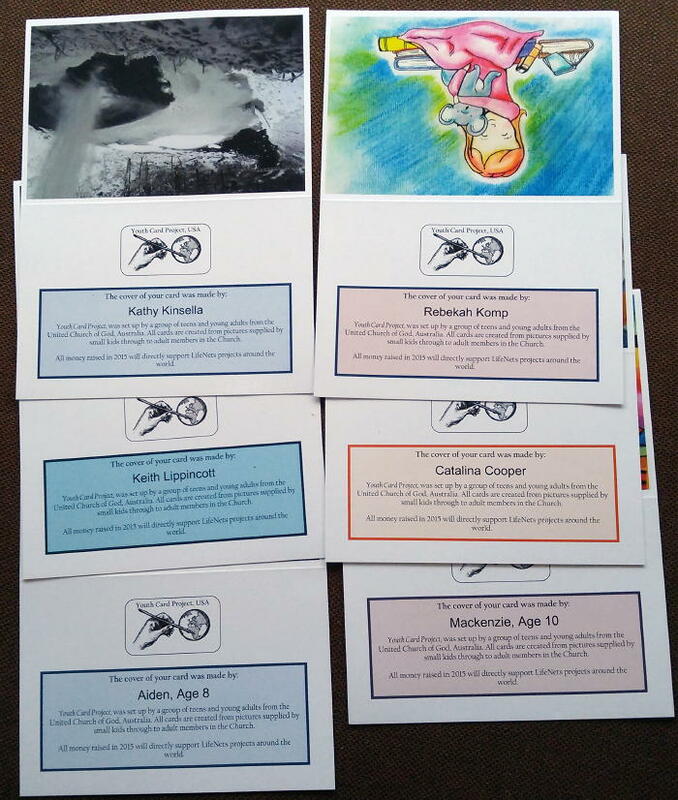 The Youth Card Project has continued to run at Feast sites across Australia, New Zealand and now in the United States (thanks to Keith Lippincott and his team), offering new batches of cards from the church membership each year. Importantly, it continues to be organised and coordinated by youth in the church. We have raised approximately AUD20,000 to date for LifeNets projects around the world, including heifers for brethren in Kenya, a roof for a rural UCG congregation in Kenya, goats for brethren in Kenya, a JohJan LifeNets Academy dormitory in Kenya, a borehole in Brazil, and scholarship funds for international church youth. We continue to be amazed and encouraged at how a little bit of effort can result in a whole lot of benefit. We know others around the world have similarly been encouraged by their own church projects, and what a bit of initiative can do. We hope young people in congregations around the world embrace their ‘giving’ potential – whatever that looks like – as we all endeavor to be meaningful participants in our local and broader church community.